Leading computerized knitting machine manufacturer SHIMA SEIKI MFG., LTD. of Wakayama, Japan, will be participating in the Techtextil exhibition in Frankfurt am Main, Germany this May. The company will show at two different booths displaying two different product lines. Flat knitting applications in technical textiles are shown with its Italian subsidiary SHIMA SEIKI ITALIA S.p.A., while cutting solutions are shown with TAJIMA GmbH. Knitted applications in the field of technical textiles take advantage of key knitting characteristics: stretch and compression. Flat knitting provides further potential as the only textile production method that can shape fabric on the machine. 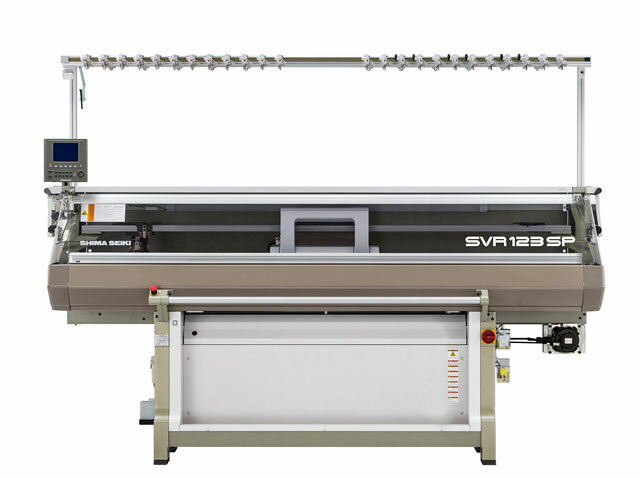 SHIMA SEIKI's new SVR123SP flat knitting machine goes a step beyond with its extra loop presser bed, capable of inlay technique used to produce hybrid knit-weave patterns suited to technical textile production. Even materials that could not be knit before such as metallic and monofilament yarns can now be now be knit. SVR123SP at Techtextil furthermore features the new i-Plating® option for even greater diversity. SHIMA SEIKI's SDS-ONE APEX3 3D design system is available for demonstrations as well. Of particular interest is its ultra-realistic simulation capability that realizes Virtual Sampling. When countless variations must be evaluated before arriving at a final design, virtual product samples can be used to streamline the decision-making process by minimizing the enormous amount of time, cost and material normally associated with producing actual samples for each variation. When approved, the same data can be used to program machines for immediate knitting, significantly reducing lead times. On display at the TAJIMA GmbH booth is the P-CAM131 multi-ply computerized cutting machine (NC cutting machine), shown for the first time at Techtextil. SHIMA SEIKI's fast, efficient and reliable P-CAM series computerized cutting machines are known for their innovative functions and Made-in-Japan quality, and boast the largest market share in Japan. A knife sharpening system produces a sharp, strong blade every time. Strong, robust components permit quicker response times for knife movement and more accurate cutting composites and other industrial materials. P-CAM machines are ideally suited to global production in a wide range of industrial applications in addition to apparel and textiles. SHIMA SEIKI’s SDS-ONE APEX3 CAD system will also be on display at the TAJIMA booth.